Still, a few automakers continue courting this formerly mainstream market. 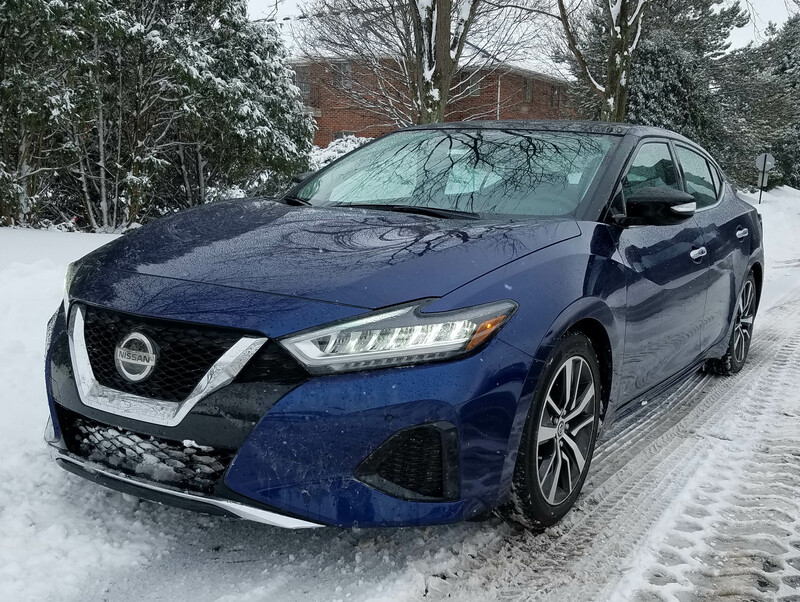 Nissan is trying to woo you with its near luxury Maxima sedan that offers refreshed styling and equipment tweaks for 2019 that may entice you to offer it a rose as you move toward amiable companionship. 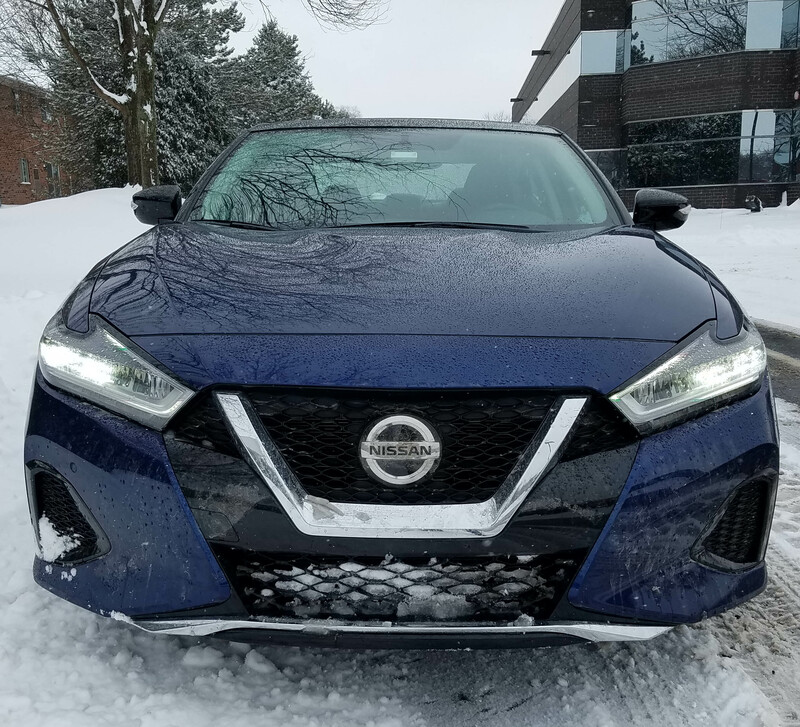 On the plus side of Maxima’s checklist of needs satisfiers is handsome styling with a more aggressive, deeper V-shaped grille and jewel-like LED headlights and taillights. Down low are some snazzy new wheel designs, and inside are semi-aniline diamond-quilted leather seats. The result is a sharp sedan with a quiet, comfortable interior. 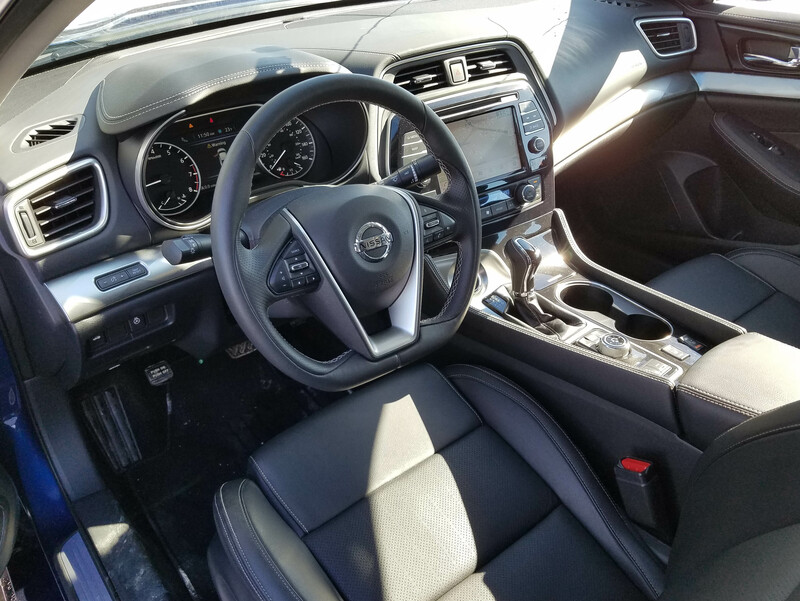 Ride is sublime thanks to the Maxima’s 109.3-inch wheelbase and well dampened suspension and an interior with an active noise cancellation system. Road noise? What road noise? Potholes? What potholes? Power exceeds expectations too with Nissan’s sturdy and smooth 3.5-liter V6 engine coupled with an Xtronic Continuously Variable Transmission (CVT). While torque, the oomph factor, is a more modest 261 rating, the svelte (3,648-lb.) 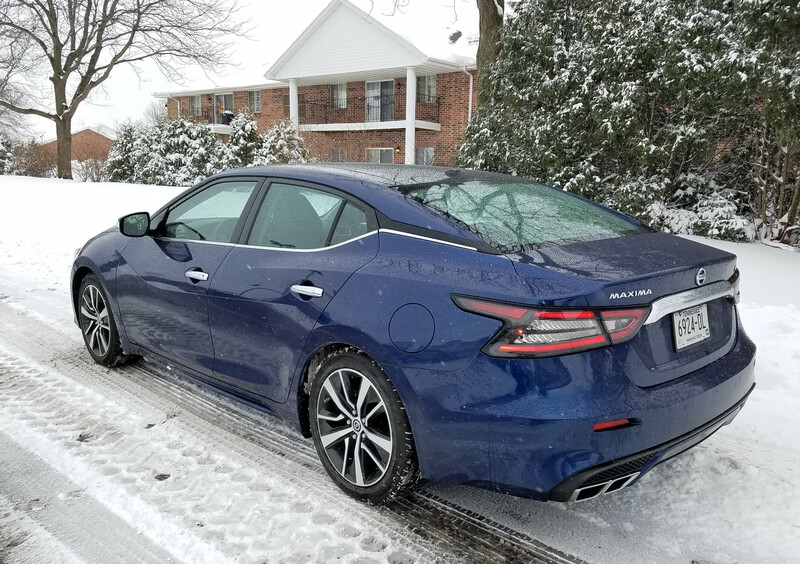 Maxima is quick on its feet, er, tires, accelerating smoothly but quickly away from stoplights or down highway entry ramps. There’s a little engine growl, just enough to keep the driver feeling engaged. Nissan and Subaru seem to offer the best CVTs, which are designed to improve gas mileage. This one seems perfectly in synch with the V6 and if you want to force earlier shifts to maximize power, well, there’s a Sport drive mode you can engage. Some might not consider Maxima’s handling as sporty as say a Volkswagen Passat, one of its competitors. But it’s much better than many mid-size sedans, providing good steering feel and road feedback. I found it easy and comfortable to drive in Normal mode. And that Sport mode that gives it more oomph also firms the steering wheel’s feel. It was fun, but for everyday driving Normal is preferred. I’d probably use Sport only on the highway. Inside, the tested pearl blue Maxima SL (mid-range trim) featured a black leather interior. Seats were perforated leather, the dash top dark and gray stitching as an accent. Trim was a wide band of diamond-patterned satin chrome and the console’s top was partially the same, the rest a gloss finish. The SL came with heated and cooled front seats and heated steering wheel. Seats were extremely comfortable with good lower back and hips support. Front seats are powered too, but I could find no driver’s seat memory buttons, which seems a bit odd. Five adults fit comfortably in Maxima and the trunk seems cavernous at 14.3 cubic feet. Rear seats split and fold down too. Overhead are dual sunroofs with power inner shades, but only the front sunroof opens to admit air. Most sightlines are fine in the car, but as many do these days, this one has a large A-pillar/mirror combo that partially obscures some side views. The steering wheel is a manual tilt/telescope model, but a racy flat-bottomed, leather-wrapped one that provides the driver more legroom when entering and exiting the car. There is the usual array of buttons on the hub, including smart cruise control and phone controls. 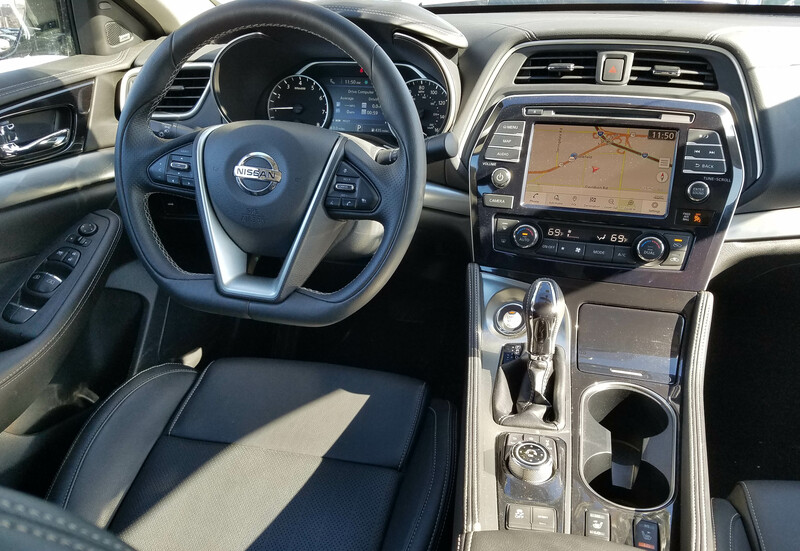 I like Nissan’s easy-to-use touchscreen surrounded by a variety of large buttons to adjust climate controls and the on-screen navigation map. Maxima has dual climate controls and also both a volume and channel tuning knob for the radio. On-screen channel selection buttons also are large. I read another review calling the dash outdated. If that’s the case, I’m all for it because of its simplicity of use while driving. The Maxima also features a fine Bose sound system with 11 speakers. I preferred the one in its Infiniti cousin, the QX50, which I’d driven the week before. But this one was sound. Apple CarPlay and Android Auto also are standard here. Certainly from a tech standpoint the Maxima is up to date. In fact, it includes its Safety Shield system with emergency braking, high-beam assist, and lane departure (you can turn it off). A backup camera and blind-spot warning also are standard. So is Intelligent Forward Collision Warning, where the sensors can look two cars ahead of you and trigger emergency braking if the system senses that car, or the one in front of you, needing to suddenly stop. Less useful, in fact often annoying, was Nissan’s rear seat sensing system that knows when you open a rear door before starting the car and if the door isn’t reopened after the car is shut off, it beeps the horn repeatedly For those of us in cold climates that may retrieve a scraper from the rear seat before we start the car and then put it back, well, this gets old quickly. Seemed every time I got out of the car in our snowy, icy weather the horn was beeping at me. Ugh! The SL model includes much of what anyone would want on a near luxury car and starts at $39,335 with delivery. Only floor mats were added for $360, to the test car ended up at $39,695. Seems to me floor mats should be standard. A base S model lists at $34,845 with delivery and all models have the same powertrain and all are front-drive. SV is the second trim level, adding leather seats, smart cruise, rear cross-traffic alert, blind-spot warning and parking sensors, so a good value at $36,855. Naturally SV has all those features, plus the sunroofs, Bose sound, heated wheel, etc. An SR trim level is sportier, listing at $40,425. It drops the SV’s dual sunroof and adds a sport suspension and more aggressive tires and wheels. The top-level Platinum model lists at $42,335 and includes nearly every option from the previous trims. Gas mileage is estimated at 20 mpg city and 30 mpg highway by the EPA and the Maxima prefers premium gas. I managed 22.8 mpg in snowy and icy winter weather with about an even mix of city and highway driving. 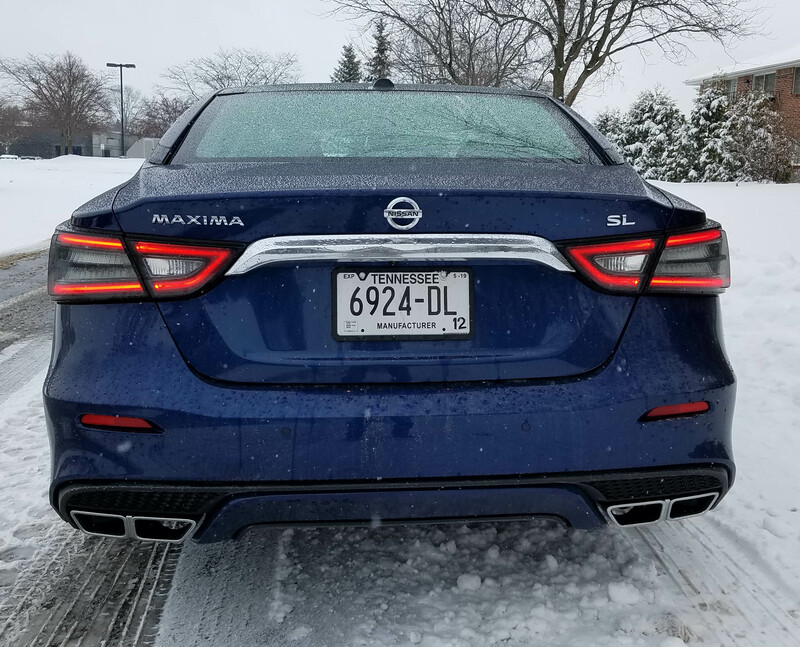 For families seeking a comfortable, powerful, near-luxury hauler, the Maxima should be atop your shopping list as driving a sedan is so much more enjoyable than most SUVs and crossovers. Hits: Excellent ride, power and good handling with quiet interior. 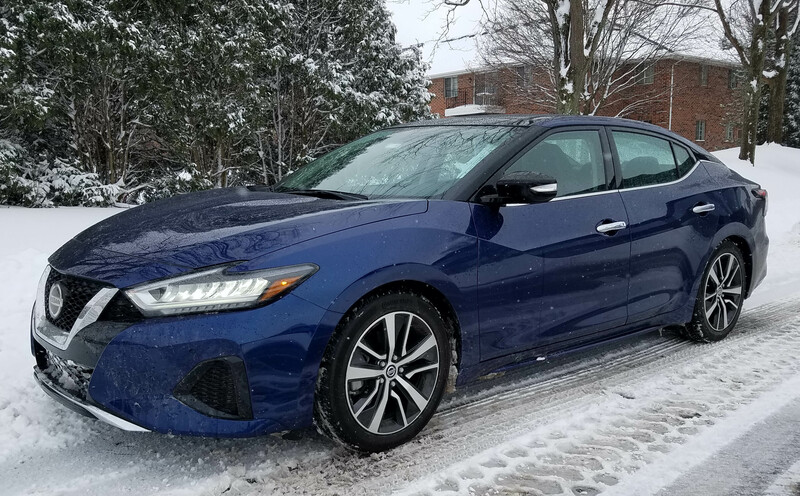 Heated/cooled seats, heated flat-bottomed wheel, big trunk, roomy interior, dual sunroofs, supportive leather seats, easy-to-use touchscreen, loaded with safety devices.